The Janome company makes a variety of machines for the home sewer. While its sewing machines are excellent, you can increase their abilities with the variety of accessory presser feet that Janome offers. 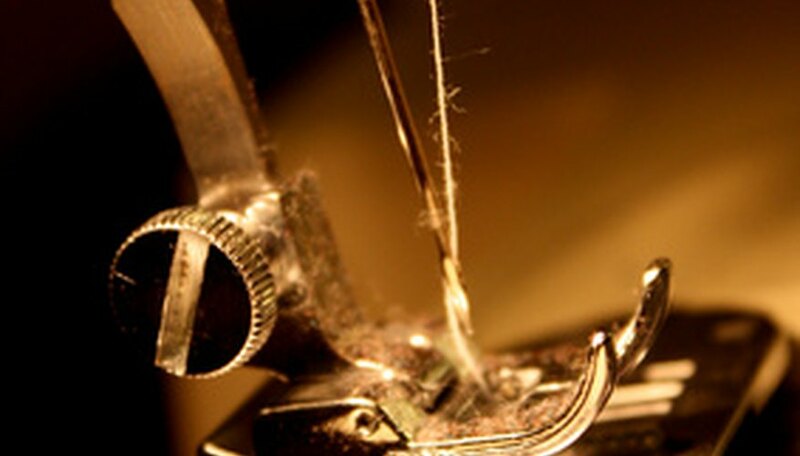 With more than 60 available feet, all affordable and easy to use, your sewing options are nearly endless. You can ruffle, gather, blind hem and attach buttonholes quickly and easily with Janome's accessory presser feet. Select the presser foot you need for your project. With more than 60 feet available, you can preselect the foot you need by visiting the Janome website (See References 1). Contact your Janome dealer to check availability and order your presser foot if necessary (See References 2). Lift your presser foot by raising the black handle to the left of the presser foot bar (See References 3, page 14). Locate the small, round red button on the back of the presser foot bar. Remove the presser foot installed on the machine by pressing the red button. The presser foot will release and drop from the presser foot bar. Gather the presser foot you want to install. There is a small horizontal bar located on the top of the presser foot. Place the presser foot below the presser foot bar with the horizontal bar lined up directly beneath the presser foot. Lower the presser foot bar with the black handle. The top of the presser foot bar connects with the horizontal bar on the presser foot. If they connect correctly, they will click. If you do not hear the click, lift the presser foot up and then down again until you hear the click. You may need to reposition the presser foot. Lift the presser foot up, and thread the machine according to Janome's instructions. Because Janome carries more than 60 different presser feet, directions for use can vary widely. Locate the manufacturer's directions for your newly installed presser foot and practice using it on a piece of scrap fabric until you are confident enough in its operation to start on your main project. Always buy Janome accessories from a licenced Janome dealer. If you have any problems, it will replace or repair your foot right away. Be sure to read your presser foot instructions carefully. The operating instructions can have detailed and intricate steps, so take your time with this. Never "force" the presser foot bar into the presser foot when you are attaching them together. They should click together easily. If you feel resistance, raise the presser foot bar and reposition the presser foot and try again.